Fork in the road for Egypt's political forces: Who will they choose? "Dr Morsi's decision to stay the course of the race indicates rising support for him," said Tamer Sarhan, a volunteer member of Mohamed Morsi's presidential campaign. Sarhan, who participated in last year's Tahrir Square uprising from its first day and who was injured by security forces and thugs dispatched by the former regime, voted for moderate-Islamist candidate Abdel-Moneim Abul-Fotouh in last month's first-round vote of Egypt's presidential elections. He was not sure who to support in the second round, but then decided to vote for Muslim Brotherhood candidate Morsi, head of the Brotherhood's Freedom and Justice Party (FJP). For Sarhan, an IT expert in his early 30s, the prospect of an Ahmed Shafiq presidency is "simply out of the question." Shafiq served as ousted president Hosni Mubarak's last prime minister and is the second presidential finalist in the runoff vote. "Shafiq was in office when we were attacked and injured during the revolution. He represents everything that the Mubarak regime stands for," Sarhan said. Maadi, an upper class residential zone in south Cairo, is already seeing what Sarhan describes as "early signs of the re-institution of the Mubarak regime." "We are seeing the return of the thugs and outlaws who used to provide electoral services to the defunct National Democratic Party [that was headed by Mubarak]; they are infringing on private and public property in Maadi with total impunity," Sarhan said. Like other revolutionaries, Sarhan believes that "the day Shafiq is sworn into office – and we're working very hard to make sure this doesn't happen – will be the day we must admit that the revolution has been stolen," he said. The second round of presidential elections will begin tomorrow, Saturday, and will end at 8pm Sunday. Registered Egyptian voters are estimated at around 50 million, but officials tell Ahram Online that they are not expecting a turnout of more than some 30 per cent – less than the roughly 45 per cent seen for the first round of elections held on 23 and 24 May. One clear reason for the expected decline in turnout is the fact that the choice between Morsi – whose FJP has been losing support due to its unimpressive parliamentary performance – and Shafiq, who is tainted by his close association with the Mubarak regime. "I don’t have to choose between religious and military fascism; for me Shafiq is the candidate supported by the ruling Supreme Council of the Armed Forces (SCAF), while Morsi is the representative of the Muslim Brotherhood, which stands for a religious – not civil– state," said Inas Mekkawy, a founding member of the Mobtloun ('Spoiling our Ballots') campaign. 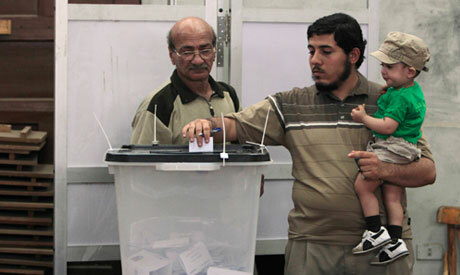 "We reject both Morsi and Shafiq," said Mekkawy, who is hoping to see some two million voters spoil their ballots. Mohamed Wakked, a leading figure of another election-boycotting campaign, said, "Why should we participate in this farce? It's a farce that is being orchestrated by the SCAF." "These alleged presidential elections will not produce a president, but rather an alleged president; someone who will be a façade while the SCAF continues to keep hold of everything," he said. On Thursday afternoon, less than two days before the runoff vote, Egypt's High Constitutional Court issued two rulings that dissolved parliament that was elected only six months ago – with an overwhelming Islamist majority – and threw out a 'political disenfranchisement law' that had aimed at barring Shafiq and other Mubarak-era officials from assuming high government office for the next ten years. Following the rulings, the SCAF reacquired the legislative powers that it had just transferred to parliament early this year, after having held them since Mubarak stepped down on 11 February 2011. The move was described by all revolutionary forces as a coup against parliamentary legitimacy, with some calling it a "military coup" and others a "constitutional coup." "It does not matter what you call it. At the end of the day, the SCAF is again showing its teeth and is again forcing its control upon the country and its future," said Dina Hani, a political activist who took part in the January 25 Revolution. Hani is a long-standing critic of the Brotherhood's political performance over the past year. "I am not just talking about their lousy performance in parliament where they became entrenched with the Salafist Nour Party in silly matters at the expense of serious issues, but I am also talking about the fierce opposition they fielded against the nomination of Abdel-Moneim Abul-Fotouh and their illogical decision to field their own presidential candidate," she said. This said, Hani is convinced that "what the SCAF is trying to do goes way beyond containing the expanding Islamist influence; they are not worried about the Islamists – they just want to tighten their grip over the country, and this is precisely what they will be doing when they see Shafiq, an ex-military man and an extension of the Mubarak regime, put in the president's seat." The Brotherhood's mistakes, grave as they might be, should not be seen as the only mistakes made since Mubarak stepped down, argued Bassem Sabri, a political activist and commentator. According to Sabri, all of Egypt's political forces are guilty of mistakes. "Each group made its own mistakes, but there is one mistake that we all made: we all failed to unify our forces and started squabbling with each another," said Sabri. It is this "unmistakable division of revolutionary powers, including the Muslim Brotherhood," Sabri argued, that allowed the SCAF to achieve its objective of offering Egyptian voters two unfavourable choices for president: Shafiq, a Mubarak regime holdover, and Morsi, an Islamist. "Had we acted differently, we could have settled on a choice between Amr Moussa and Abul-Fotouh, for example," Sabri said. Wakked agreed. "The objective was to force two unfavourable choices on voters." Wakked is one of the very few activists who sees a serious chance for Morsi to make it to the top executive post "if the SCAF decides it is okay with that." In Wakked's analysis, the "Morsi scenario" means that the SCAF "feels strong and confident and that it can handle Morsi as president for a few months before he is eventually kicked out by the SCAF – one way or another." The "Shafiq scenario" for Wakked is, however, a sign that the SCAF would feel more comfortable with an ex-military figure at the top, so that it can attend to other matters that might be more pressing for it, "including internal military issues that we cannot predict." On 26 June, the name of Egypt's next president will be officially announced, and on 1 July, this new president should take over executive powers from SCAF – but he will be doing so in the absence of a constitution. The lack of a constitution defining his role will not be the only problem the new president will face. With an expected low turnout for the elections, the next president will also have a problem of stable legitimacy. There are also serious concerns about wide public protests, especially in the case of a win for Shafiq, who stepped down as prime minister less than four weeks after Mubarak's ouster following a wave of popular demonstrations. "We are not sure yet how we are going to react if Shafiq is elected president; demonstrations are one option, but we might come up with alternatives," said political activist Khaled Abdel-Hamid. "Sit-ins and civil disobedience are always options to consider," he added. Meanwhile, a prolonged state of instability has been predicted by several Western embassies in Cairo. Instability is expected whether Shafiq or Morsi are elected – but a worse wave of protests is anticipated if Shafiq wins the presidency, as he is seen by many Egyptians as an "enemy of the revolution." The headline of your report is quite biased to the old regime, though the main body you have various opinions. The better is do like the NY Times or other American jornos and pledge your support to your candidate, don't disguise behind the veil. what a rubbish article. a self-glorified article by delusioned secularists who still flaunting their hidden secular agenda despite the country being robbed by mubarak stooges!